The Coast to Coast Trail closely follows the line of two historic transport routes. The early horse-worked Portreath tramroad opened in 1812. This was the first surface tramroad in Cornwall. It gave the copper mines around Scorrier and St Day a transport route to the sea at Portreath. The other was the Redruth & Chasewater Railway. This was built from 1825 and linked the town of Redruth and mines around Gwennap, then the richest copper producing area in the world, to the port of Devoran on the south coast. 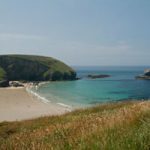 Points of interest: The Coast to Coast Trail provides the user with the opportunity to literally ride or walk across Cornwall in less than a day, from one coast to another as the trail links the historic mining harbour of Portreath on the north coast and port of Devoran on the south coast. Enjoy spectacular scenery and a variety of wildlife as the trail passes through ancient woodland and heathland. The trail gives a unique insight into the area’s mining heritage as you pass by historic mine sites now transformed by nature. The route is challenging more for its length than its degree of difficulty. It will take you roughly 1.5 hours to cover going faster than the 2mph as mentioned below. Terrain: Challenging because of distance covered. Portreath is a small coastal village with a very narrow harbour located about 5 miles north of Redruth. It was once a busy port, importing coal and exporting copper but now only sheltering the occasional fishing boat. The pretty, sandy beach has a stream running down to the sea on the left hand side. It is a popular family beach. Scorrier House, located near the village of Scorrier, built in 1778 by John Williams the 3rd. John Williams was described in 1868 as “one of the most extensive and most successful managers of mines, as well as adventurers, the county ever produced”. Through his interest in mining and geology, he amassed a famous mineral collection which has been described as one of the most important collections of Cornish minerals ever assembled. During a national currency shortage in the early 19th century, John Williams took the initiative to pay workers in his own Cornish currency mined from his own mines. The gardens are notable, particularly due to the influence of William Lobb, a famous Victorian nurseryman, botanist and plant hunter, who worked for the Williams family. Poldice mine is a former metalliferous mine located in Poldice Valley. Situated between the villages of Twelveheads and St Day. The mine was extracting tin ore in 1748, but by 1788 the output of copper ore exceeded that of tin, and by the 1790s it was making a good profit. Later the mine switched to arsenic extraction, although metals were still being mined in decreasing quantities, but by the 1910s most of the activity was over. The landscape reflects it’s mining roots and wouldn’t look out of place on a Dr Who film set. Carnon viaduct carries the railway from Truro to Falmouth. The present nine-arch masonry viaduct replaces an earlier structure designed by Isambard Kingdom Brunel for the Cornwall Railway. The original viaduct was opened to traffic when the line was extended from Truro to Falmouth in 1863 and had a timber deck supported by timber trestles springing from eleven masonry piers. Gwennap trail loops off here. Devoran played an important role in the tin and copper mining industry. It developed as a small port engaged in the export of mined minerals and the import of mining materials and coal. The Redruth and Chasewater Railway, an early industrial line which served the many mines a few miles to the north, terminated at the port (although there was an extension to wharves at Point on which trains were hauled by horses rather than locomotives). Restronguet creek is a lovely place to kayak up.